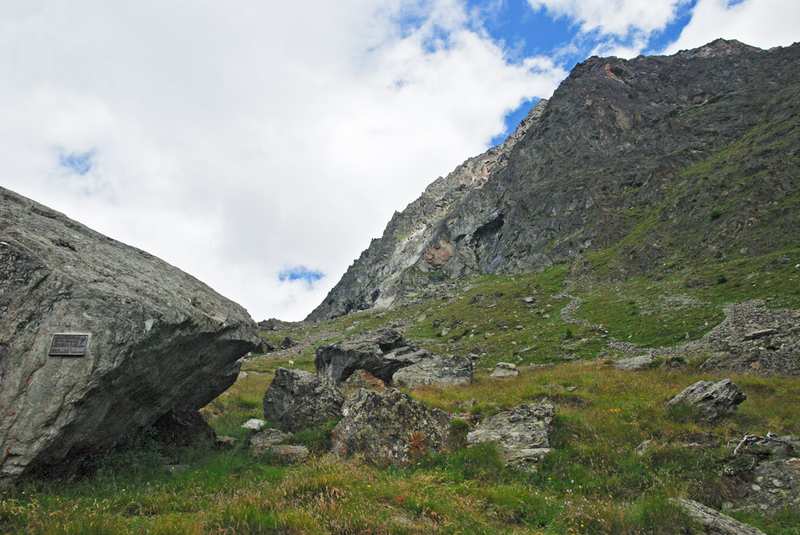 This is the second of a series of three posts about the Dom (Switzerland’s highest mountain). If you have not read the first post then you will find it helpful to read it now before continuing to read this. Click here. Today’s post describes the events surrounding the climb to the Dom Hut in preparation for the summit climb. 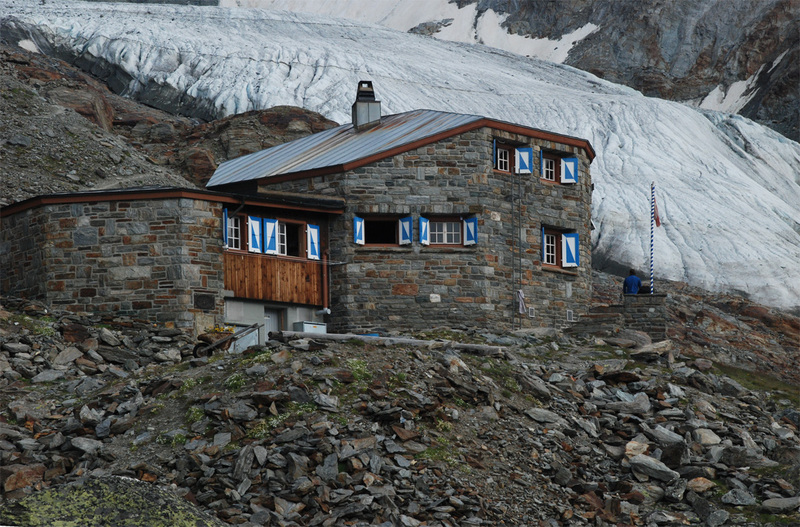 Note: The Dom Hut was closed for the 2012 Summer season and re-opens on 7 July 2013. Read the Press release here. 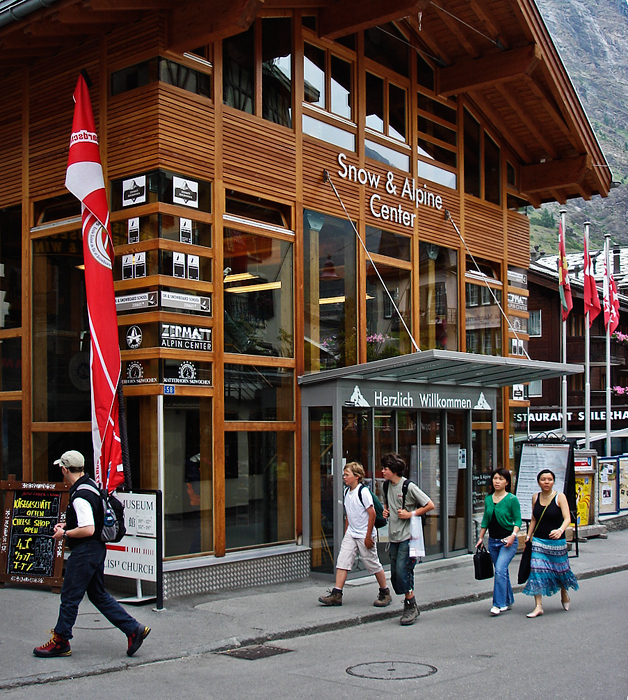 I double-checked the weather before I visited the Alpine Centre to book my guide for the Dom. For me, booking a guide was a simple transaction – I’d been there before to book guides – but it’s always a surprisingly casual process for a venture that is not without risk. You approach the desk, state what you want to climb and the dates you have in mind. The person behind the desk takes down your details, checks you have insurance, consults the computer, makes some enquiries, and you are assigned a guide; or sometimes you may be asked to call back later after guides return from climbs and are contactable. Bizarrely there is no questionnaire to complete to describe your experience and level of skills. So much is taken on trust – on both sides. The guide has to trust the client to make sensible decisions, have the correct equipment, and sign up to a climb that is within their competence and fitness. And the clients have to have trust in the Guide – a person who is entirely unknown and who they will meet for the first time when they reach the Hut. The fee is paid in advance. For the Dom in 2008 it was 899 Swiss Francs. Over and above that are the costs of the night at the hut including the evening meal. I walked away with an A4 sheet of paper that summarized the climb, the equipment needed and the guide’s name: Jürg Martig. As I was leaving the lady behind the desk smiled and said: ‘If you make it to the hut, you’ll make it to the summit.’ Not exactly a confidence boosting comment, but I had read the guide books. One described the hut climb as ‘a notoriously steep hut walk’. Another said of the Dom climb: ‘in a very remote area with no cableway and therefore people are, through the efforts of the ascent, correspondingly hand-picked’! I also now know (but didn’t at the time) that the resident Zermatt guides will not normally guide the Dom because the effort involved is too great! The remainder of the day was spent checking kit, buying food and water, and then double-checking. Keeping my rucsac as light as possible but ensuring that I had clothing for a bad weather day – mountain weather can be very fickle. About midday the following day I set off, catching the train from Zermatt down the valley to Randa from where the ascent began. The guide books said 4-5hrs to the hut. An ascent of 1510M (approx 5000ft). If you know where to look, you can just pick out the hut from Randa, perched on the edge of a high ridge (an image taken on a different day). It looked a long way away. The day was hot and humid, it had started cloudy, cleared, and then became progressively overcast through the afternoon. A signpost pointed the way and I soon entered the Larch woods of the lower slopes and got into the familiar rhythm well known to mountain walkers. A metronomic pace and breathing pattern, adjusting footfalls and stride strength to suit the terrain, always maintaining the rhythm. Slowly I gained height as the path zig-zagged its way upwards. I stopped in the wood to eat some lunch and drink. Eventually after about 90 mins I crossed the tree line and the path wound through rough pasture crossing the Europaweg within sight of the new Europa Hutte. 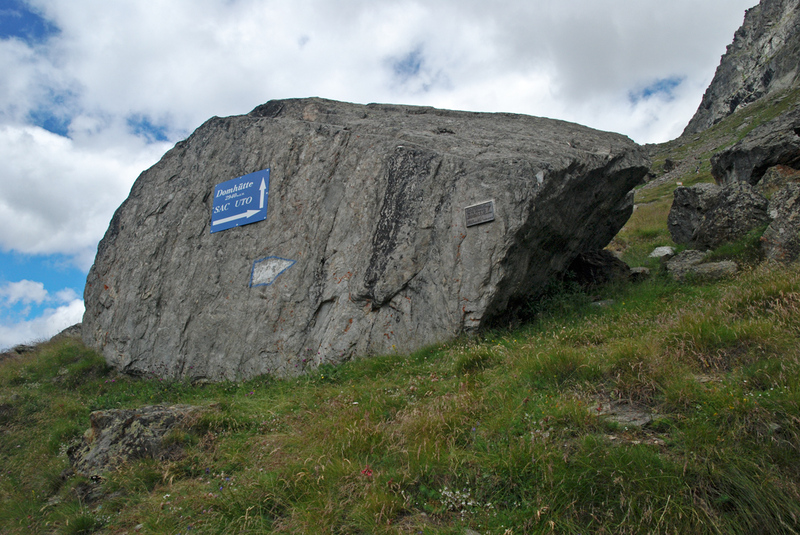 Ahead was a huge boulder with a direction sign pointing improbably toward a high rock barrier – well over 1500ft high. This is where the route started to live up to its reputation as ‘notoriously steep’. A steep path to the foot of the cliff seemed to lead nowhere. But looking higher up I could spot occasional figures on an invisible path, completely disconnected one from the other, or so it appeared. The route gradually revealed itself: weaving and twisting it’s way up a rocky staircase, seeking out the line of least resistance. Tricky sections were protected by iron steps bolted to the rock, fixed ropes and cables. The climbing was not technical but the inability to maintain any sort of rhythm made it more exhausting. The only encouraging fact was that everyone else seemed to be finding it hard too whether going up or down. 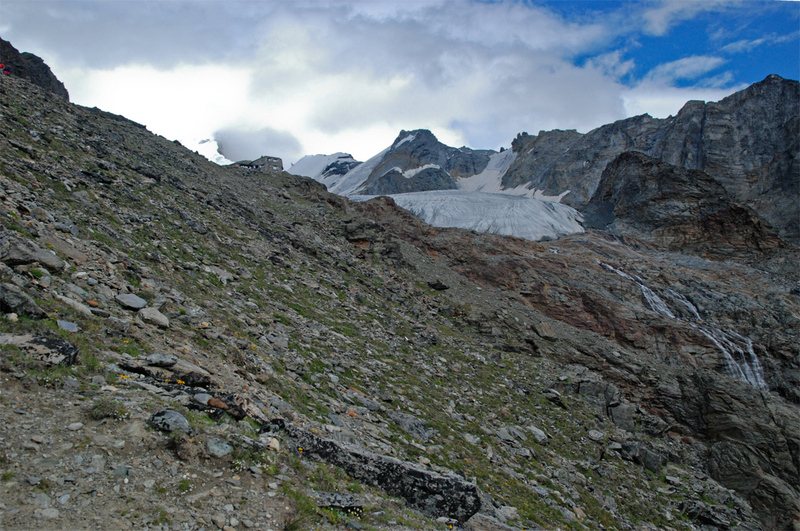 Eventually after about 90mins of grim slog the route emerged above the barrier and a reasonable path then wound around the hillside until the smallish hut came into view, sited close to the the edge of the Festi glacier. From here the valley looked very far away. The sky was heavy with cloud, the high peaks shrouded – not what the doctor ordered. But tomorrow was another day. 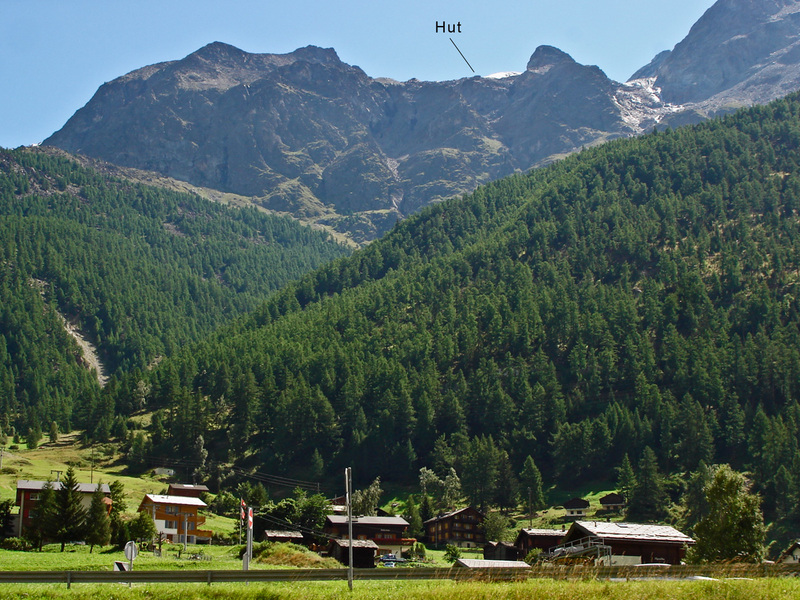 I made it to the hut in three and half hours of walking time, four hours with stops. It was shortly before 5pm when I arrived. The guardians spoke English (not all do). I was expected, I signed in and was shown to my place in one of the dormitories. Someone (my guide) was fast asleep in the next space. The Dom Hut was upgraded in 1978 and sleeps 75 but by the standard of many modern huts it is beginning to seem quite old fashioned. When I visited there were still long drop toilets in outdoor wooden huts, and no hot showers. The dormitories were still two-tiered with long rows of mattresses, each three foot wide with two blankets each. A word about Hut etiquette. Boots are left in the lobby or boot room, as are Ice axes, crampons and walking poles. Take a sheet sleeping bag. Fold the blankets back up before you leave in the morning. Observe the lights out time and keep noise to a minimum in the dormitories. Re-pack and organize your rucsac long before lights out. A hut is many things. A staging post, a refuge, a place to re-charge and re-fuel, a place to catch up on sleep after a long day’s climb, a place of safety. 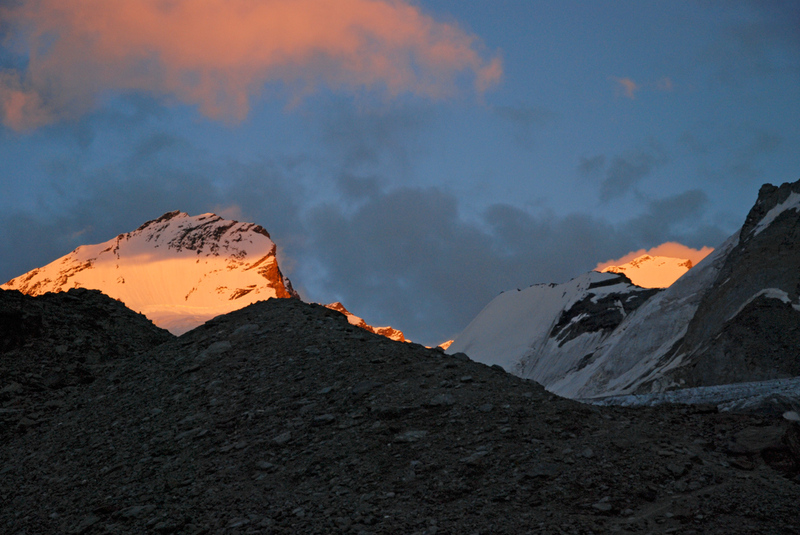 A microcosm of mountaineering skills, knowledge and camaraderie. Step into the main room of a Hut, and you will hear a babel of languages: French, German, Italian, maybe Spanish, increasingly eastern European and Scandinavian languages, and sometimes English. Men and women, young and old, novice and experienced. Guides with their clients, and self guided parties. Many studying routes and maps, discussing and learning from each other. On one’s own, huts can seem intimidating places at first. But when the evening meal is served then you will find yourself wedged into a tight space at a table and the barriers have to come down; communication takes place, sometimes faltingly in English or French – everyone tries. Mountaineering is a universal language. It’s independent of class, status and religion. With very few exceptions the community you will meet will be friendly, trustworthy and courteous, and prepared to help in a crisis. There were two hours to the evening meal. 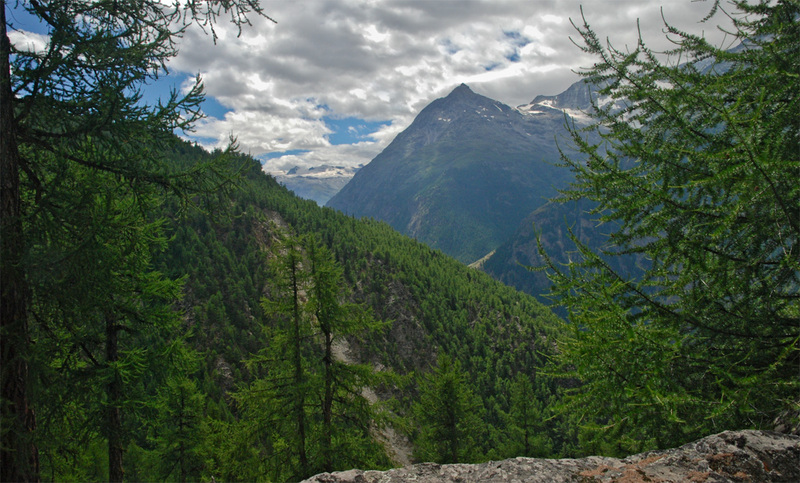 I downed a Cardinal beer, sorted my rucsac, making sure the clothes and gear I would need in the morning were easily accessible, and quietly laid out the sleeping bag, My guide was was still fast asleep. By 7pm I was getting slightly concerned as to whether he was comatose rather than sleeping! Outside the clouds were still down on the mountains but none looked ominous. The hut was full – dinner was to be served in two sittings. Finally Jürg emerged – and immediately I felt at ease with him (what a difference that makes). A tough looking Swiss guide aged about 40 with a ready smile and a firm handshake, who spoke good English. From Kandersteg although he had worked and lived in Zermatt for 9 years in the recent past. 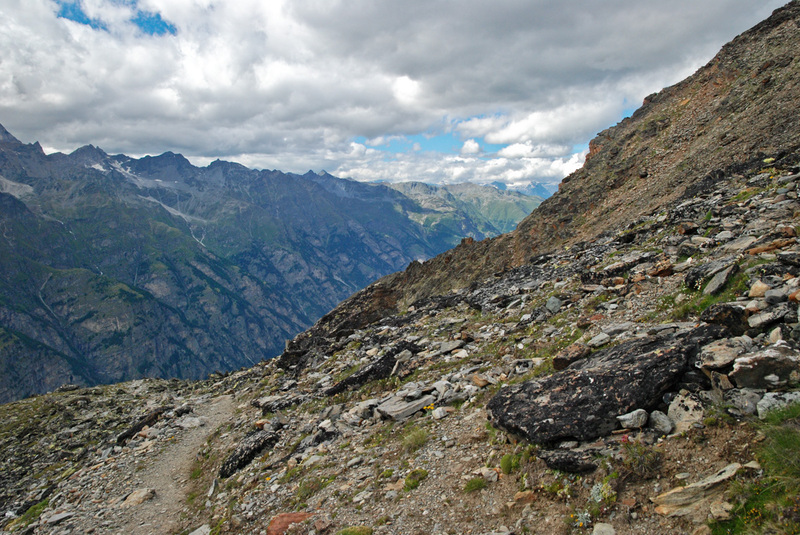 Sunday – guided client up the Hornli ridge of the Matterhorn. Stayed overnight in the Hut and guided another client up the Hornli ridge on Monday. After the second summit on Monday, descended down to Schwarzsee, cable car to Zermatt, train to Randa and walked up to the Dom Hut all on the same day. And was now prepared to guide me to the Dom’s summit tomorrow – Wednesday. An extraordinary schedule. 4 major 4000M summits in four days. No wonder he needed some sleep! I realized from this schedule that he would have been high on the Matterhorn when we saw the Rescue Helicopter hovering over the Matterhorn summit two days earlier (see previous post for story and click here to review the image). 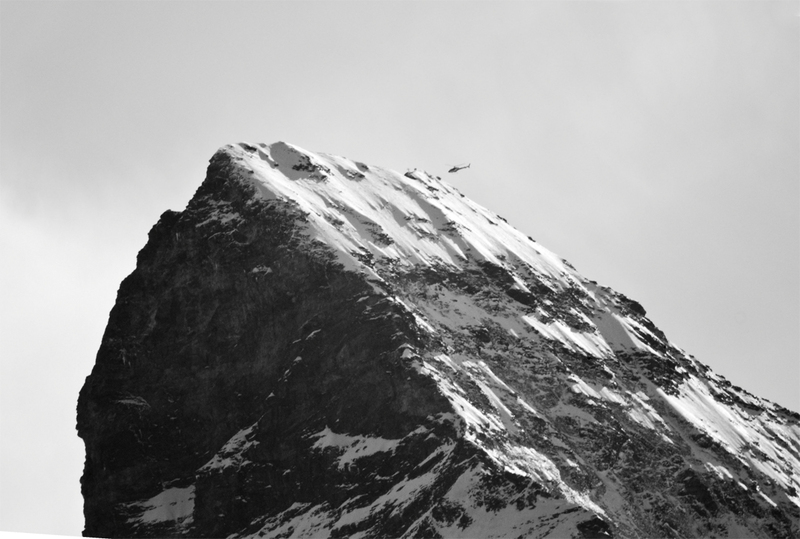 I mentioned what we had observed, and he told me that he had been a short distance away when a climber fell close to the summit, descending the iced-up roof of the North Face of the Matterhorn (normally in summer that section is dry rock). A short fall but far enough to fracture his lower leg (Tib+Fib). Jürg and others close by had radioed for the helicopter and looked after the injured climber until the delicate process of winching him off the steep face into the helicopter was complete. How small our world is sometimes. The evening meal in a hut is always a good three course meal – soup, meat and potatoes, pasta or rice, and a dessert. After the meal Jürg checked through my equipment, and asked about my previous experience, etc – thorough and efficient. We sat outside chatting as the clouds cleared. I discovered that for the last 4yrs he had been guiding parties up Kilimanjaro as well as working in the winter as a ski instructor and as a mountain guide in the summer. He impressed on me that we would be out of the hut in the morning ahead of the queue – there being about 70 or so climbers all with the same objective in mind. 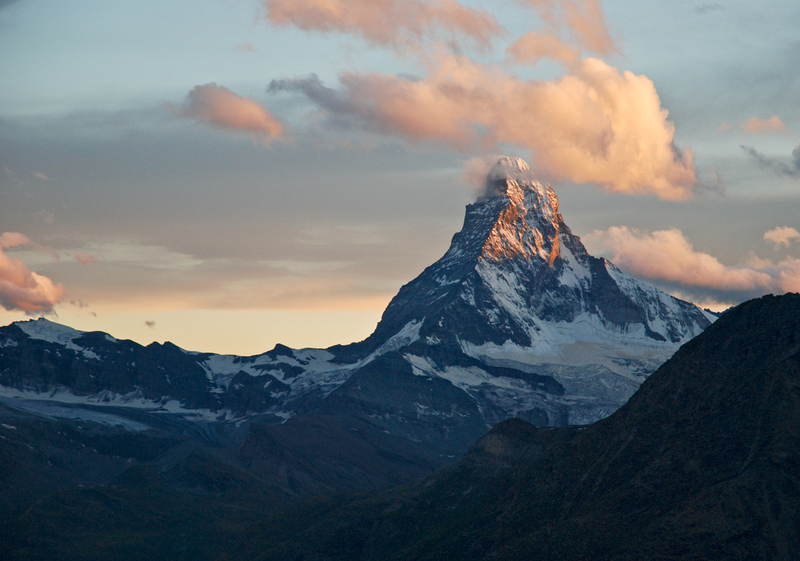 As the evening wore on the summits slowly cleared with a fantastic ‘alpine glow’ on the Matterhorn and on a portion of the Dom high above us. Everyone turned in, the lights went out. Why is it always the loudest snorers that fall asleep first!? 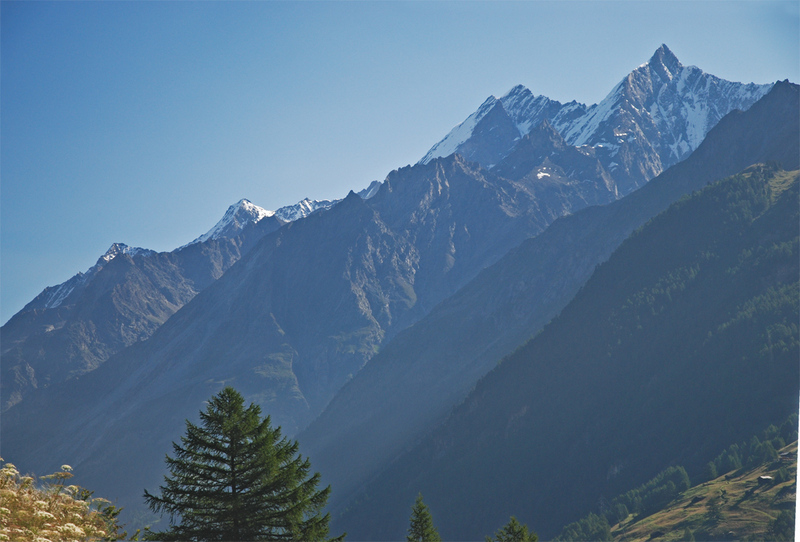 Click on the link that follows to move on to Part 3: Climbing the Dom – The Summit Climb. This entry was posted in Climb and Trek, MountainScape and tagged Alpine Glow, Alpine Mountaineering, Dom, Dom Hut, Matterhorn, Mischabel, Mountainscape, Photography, Sunset, Valais Alps, Zermatt. Bookmark the permalink. Once again, a great post – looking forward to Part 3! Love alps, love Zermatt, can’t wait to go there again!!! Great photos you collected from that place!!! Thanks Pawel. It is a fantastic place. Been there about 18 times I think – winter and summer. Next trip in 10days! Dang, and my legs complain about climbing some of our little baby hills around here. Stunning scenery! Thanks Rob. Another long hike in tomorrow’s post. Sorry! Sounds like a great adventure. Awaiting pt. 3! Thanks Ken – Part 3 will be on your screen tomorrow. Awesome post Andy!!!!! Really great! I’m so envy!!! 🙂 I’ve never climbed, not that way, not the alps, but I love mountains, they give you all that peaceful and powerful energy at the same time. Thanks for the tips and for telling the details, specially for people like me. Going now to read the final part….